This project has been funded with the support from the European Commission in the framework of the Erasmus + Programme. This promotional page and its content reflects the views only of the project partners, and the Commission cannot be held responsable for any use which may be made of the information contained therein. 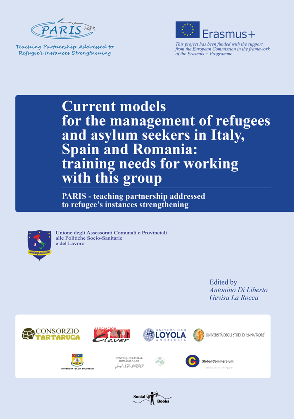 On the occasion of the PARIS project presentation - Teaching Partnership Addressed to Refugees’ Instances Strengthening, funded by the European Union under the ERASMUS+ - an International Conference will be organized at the University of Enna “Kore”. In cooperation with the Universitatea din Bucharesti, Universidad Loyola Andalucia, Asociación Claver, Consorzio Tartaruga, Global Commercium Development and with the support of the Universidad de la Laguna and PIC-Ais (Italian Association of Sociology, Processes and Cultural Institutions). The aim of the International Conference is to promote the results of the Project and to respond at the debate on the European reception system and scenario’s changes. The event wants to strengthen the results achieved by PARIS Project and, update them. This is a need related to the start date of the Project 2016. From then to the present, reception policies have made change. What should we do, once the idea of “closed harbor” is spreading across Europe? The aim is thence: to reflect the changes in the European scenario, on basic Human Rights; Reflections on Public Debates and Political-Analytical Challenges and, their Dissemination in the Media; Migration Territories; Studies Based on Migration and Data Sources about Migration; Gender Perspective and Migration; European and National Policies; European Citizens and Communities of Hospitality; Migration, Risk, and Uncertainty Construction of Migrant’s Fear and Trauma; Possibilities and Benefits of Cultural Mediation; Images of Migration; The Role of Social Work in Health Care System; Education and Health; Psychological and Legal Assistance of Migrants; The Role and Reputation of NGOs; New Perspectives in the Construction of Peace. We encourage theoretical and research papers. This website uses session cookies for navigation and social network cookies. © 2017-2019 Consorzio Tartaruga - Palermo (Italy). All Rights Reserved.